I had completed my internship on Foster's Home, and was visiting CN, saying hi to peoples. I went to see Joey, who had recently been promoted to a well deserved artistic position. When I walked in he was doodling this little guy below. 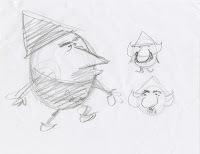 He had never animated before, and wanted to learn Flash, so he was working on some characters for his first ever short. The short was "Big Foot and a Gnome". I thought it was a great idea... considering the first short I ever animated in Flash was oddly enough Sasquatch and Elf Boy... about a Sasquatch (Big Foot) and an Elf Boy (a Gnome). We knew it was a sign, and decided to team up. We started doing a rough storyboard, writing gags, and figuring out who these characters were. Production was shaky, as Joey was busy on Foster's, and quite frankly we didn't know how to work well with each other. 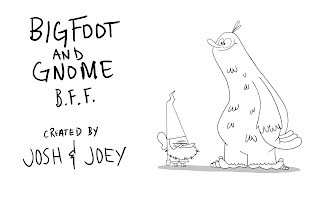 After a month or so away from the project, CN announced the Cartoonstitute and both Joey and myself felt like Big Foot and Gnome was a good fit, considering the type of shorts they were looking for; character driven, minimal background/props, and an ability to be turned into a series. We were fortunate enough to be able to book a time to pitch, and went back to work developing the short. We pitched on June 5, the exact one year anniversary that I had moved out to LA to intern at CN. We went in with a few drawings and a short list of episode ideas, which we presented to Craig McCracken and Rob Renzetti. They liked the set up and relationship between the two, but wanted to see if we could "change" what these guys were and make them more unique, a re-casting of sorts, keep their personalities in tact just change the exterior. So me and Joey went to work re-designing Big Foot and Gnome. First up to the plate was Gnome, and it was either hit or miss with him. We liked the pairing of a humanoid figure with an animal/mythical creature, so we tried to keep that balance. Joey came up with the idea of a Merman or a Mer-Monkey (1/2 Merman 1/2 Sea-Monkey), which I thought was hilarious.I don't remember exactly who suggested a leprechaun, but basically we just took Gnome and put him in a Leprechaun's outfit, and it worked. And that (in part) is why Khan is not actually a Leprechaun, just some guy sporting the outfit. Since we had a human figure established now we knew the Big Foot character would continue to be of a creature nature. It was very straining (at the time) to come up with various "beings" for Big Foot. I had known him as Big Foot for so long, that nothing else seemed right. We tried things like; land-sharks, dragons, but the character needed to be soft and lovable. I've always liked platypi, and since we didn't use the platypus design for Khan, I tried it for Big Foot. It was ok... but he had to be mythical, so instinctively, I made him half-man. The same way a Big Foot is of essence half man half ape, this guy would be half man half platypus, and at that point "Man-O-Puss" just popped into my head. I didn't really think much of it, but Joey liked it a lot. It was also an easy fix for Big Foot, it was basically the same design just with a duck-bill instead of a nose. Rob and Craig were cool with it, so it stuck. So after a lot of pushing, Manny and Khan were born. So you see, although it may appear as though a Leprachaun and a Man-o-puss are a completely random coupling, there is actually a quite logical explanation for the odd-pair (except for the half man half platypus part). Sorry about not sending the pics last night my email is not uploading any images for some reason. So a DS and a merman are clues, yes?